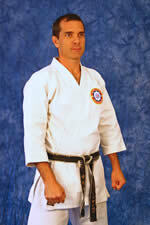 This spin on the exercise makes it more dynamic, and a precursor for dojo sparring. 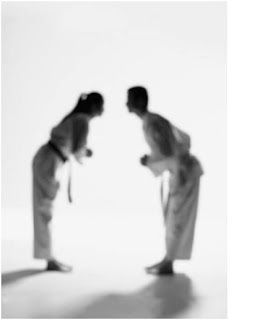 If you’re not sure, “ippon kumite” (one point sparring) basically refers to a single attack (usually prearranged) with the defender making a block and counter attack (also usually prearranged). However different dojos and teachers make different variations and rules on the attacks and defenses, to the point where both the attack and defense can be completely random. This method that I’m sharing with you today, shows you how to start off easy so everyone in your class can manage, yet allows you to increase the difficulty with each step. Step #1 – Do the basics first – get everyone up to speed. Before you dive in the deep end, do some basic repetitions as a group, 10 times for each technique. The 3 techniques will be oizuki jodan, oizuki chudan, and oizuki gedan (step over punch to the head, chest and stomach respectively). Now have your class, do basic reps for the blocking portion of the exercise (no counter yet). For 10 reps each, have your class step back, block up, across and down respectively. Step # 2 – Pair up, and repeat. Now that the basic attack/defense is familiar, choose one side to attack, the other to defend with the same basics you practiced in Step #1. Eg. Attacker makes oizuki jodan, defender steps back and blocks up. Then immediately switch roles so that the person who just blocked up now makes oizuki jodan and the other person steps back and blocks up. Don’t “reset” after each attack, but simply switch roles after each attack/defense so your class is going back and forth to your count. Do this 10 times for each different attacking technique. Step #3 – Randomize it. Now that your class has done the basic step over punch/step back block and countering with the same attack as they just received, let’s now randomize the attack. Eg. Attacker might step over punch to the head, while the defender steps back and blocks up. At this point the defender (now becomes the attacker) and steps over punches to the chest, while the new defender steps back and blocks across. At which point roles switch again and the attack might now be step over punch to the stomach and the defense step back block down, countering with step over punch to the chest… and so on and so forth. So you see it becomes a flowing attack/defense drill (somewhat prearranged, yet somewhat random). This is a good way to have students learn basics in motion with a partner. For more advanced grades, increase the variety of attacking techniques. For example you might like to add another 3 attacks which might be mae geri (front kick) using the rear leg and landing forward. Attack # 5 might be rear leg mawashi geri (roundhouse kick) landing forward, and attack #6 might be step over strike to the top of the head tetsui (hammer fist) or “icepick – type” attack. Of course you’ll need 3 basic step back blocking techniques to match, but I’ll let you figure those out. You could follow this same process, adding another 3 techniques each time until you have 9 or 12 different prearranged attacks and defenses, but when you plug it into this exercise it becomes somewhat random. It’s good one because you can set it up for whichever level you’re teaching and even the most advanced students will be challenged by it. make the decision even easier for you to attend! that will dramatically boost your student enrollments. and say, “YES! I’ll coming!”. “Ok, ok!, just stop hurting me!“, he begged. would be worth making the effort to come along! This is going to be awesome! Sincerely hope you can make it!